Frostbite is an injury to the skin and underlying tissue (in severe instances) that result from prolonged exposure to freezing temperatures, which is often exacerbated by wind chill. Most of the time, it's exposed skin that's at risk of frostbite, but if temperatures are cold enough and one remains in the cold long enough with insufficient wardrobe protection, even unexposed skin can freeze. Although temperatures in Montreal rarely reach levels of extreme frostbite risk, knowing what level of risk is associated with temperature ranges can go a long way to preparing you for the cold and protecting your delicate skin from this type of injury. 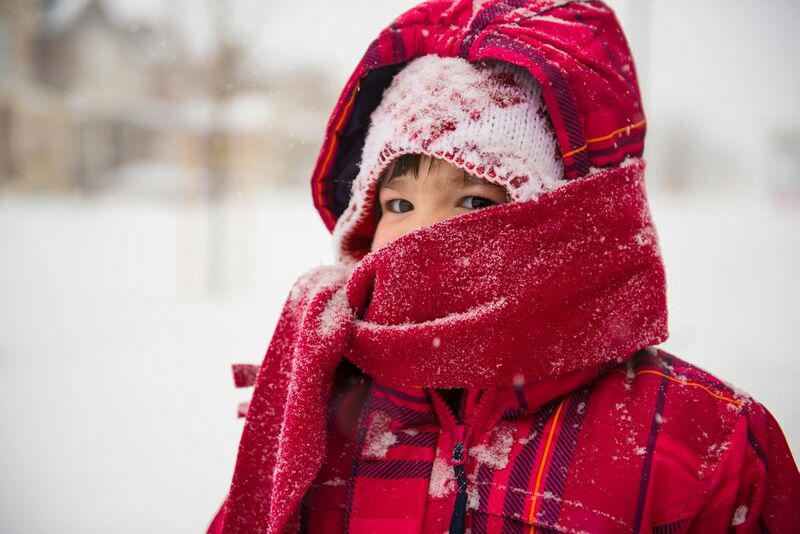 Fortunately, Environment Canada has issued several guidelines on dealing with frostbite-inducing weather. The following guidelines can give you a better idea of the level of frostbite risk to be expected depending on the temperature. Always remember when determining frostbite risk as categorized below to factor in any drop in temperature due to wind chill. When it comes to how long your skin can be exposed to extremely low temperatures, there are a variety of factors that affect your ability to withstand colder temperatures for longer. Along with how cold it is outside and what you're wearing, your health, physical size, age, and what you're wearing and doing outdoors can greatly affect how susceptible you are to frostbite. For instance, infants lose heat faster than adults, diabetics suffer from poor circulation and are thus more vulnerable to frostbite, and someone who is tall and willowy will lose body heat faster than a short and stocky individual. Additionally, wind chill can play a big part in how quickly your body will suffer from this type of injury. From freezing down to 16.6 degrees below freezing Fahrenheit, there may be a slight increase in discomfort from prolonged exposure to the cold, but there's not much to worry about in terms of getting frostbitten. While not the most comfortable of temperatures, your risk of serious injury is still relatively low between these temperatures, even if you're not dressed appropriately, though there is a risk of hypothermia with prolonged exposure to this temperature range without adequate protection. As a result, you should try to dress for the weather by properly layering your clothing and making sure your skin is fully covered by fabric. Consider at least three layers complete with a wind-resistant coat before venturing outdoors; you might want to invest in a down-filled coat at this point as polyester fill and even wool coasts are inadequate for these temperatures. You should also wear a hat, earmuffs, gloves, a scarf, and water-resistant boots so you can stay dry and protect your extremities from the cold. Adequate protection from the elements is absolutely essential at this point as the risk of frostbite as well as hypothermia are significantly heightened as soon as temperatures, with or without wind chill, dip below negative 16.6 degrees Fahrenheit (negative 27 degrees Celcius). People traveling in these conditions, even with proper protection from the elements, can get frostbite anywhere between 10 to 30 minutes of exposure to the elements. As a result, it's highly recommended that outdoor activities be engaged in at least pairs if not groups in order to check each other's faces for possible signs of frostbite; you'll want to keep an eye out for whiteness or numbness in the skin. While outdoors, you should also stay active and keep moving as staying still will cause the blood circulation to slow to your extremities and could decrease the time it takes for frostbite to affect them. In addition to wearing at least three layers of clothing including a down-filled, wind-resistant coat, you may also want to consider investing in boot and glove warming pads if you need to be outdoors longer than 10 minutes. It's critically important that you stay dry while outdoors in these temperatures as wet skin will almost certainly suffer from frostbite at between negative 38.2 and negative 18.4 degrees Fahrenheit. The risk of frostbite, as well as hypothermia, are imminent if exposure to temperatures of between negative 40 degrees Fahrenheit (negative 40 degrees Celcius) and negative 52.6 (negative 47) is prolonged without adequate protection and shelter. As with medium-risk temperatures, outdoor activities should not be attempted without a partner as frostbite can start affecting your skin within five to 10 minutes of exposure; if winds are sustained at over 31 miles (50 kilometers) per hour, you can be frostbitten in even less time. You should avoid going outdoors in temperatures below negative 40 degrees Fahrenheit, but should also check your pipes, electrical system, and back-up generator as these extremely cold temperatures can also affect these systems in your home. Both frostbite and hypothermia are virtually guaranteed if exposure to temperatures below negative 54.4 degrees Fahrenheit (negative 48 degrees Celcius) is prolonged without adequate protection and shelter. Even with proper protection, frostbite can occur within two to five minutes—or less in sustained winds over 31 miles (50 kilometers) per hour. Under no circumstances should you venture out into this type of weather alone, and you should highly consider cutting short or canceling any outdoor activities. If you do have to venture outdoors, you should wear at least four layers of clothing including thermal underwear and a down-filled coat as well as boot and glove warmers. None of your skin should be directly exposed to the cold air, but you also run a risk of frostbite even under multiple layers of clothing at these temperatures. Within two minutes of being outdoors in temperatures below negative 67 degrees Fahrenheit (negative 55 degrees Celcius), your skin can suffer serious injury from frostbite and/or hypothermia. Under no conditions should you leave your shelter or venture outdoors in these temperatures as conditions are too hazardous for any kind of activity—even walking to your vehicle or from building to building. Instead, hunker down where you are and be sure you are adequately prepared to wait out the cold front until temperatures climb back up to a manageable level. Is Winter in Montreal THAT Bad?